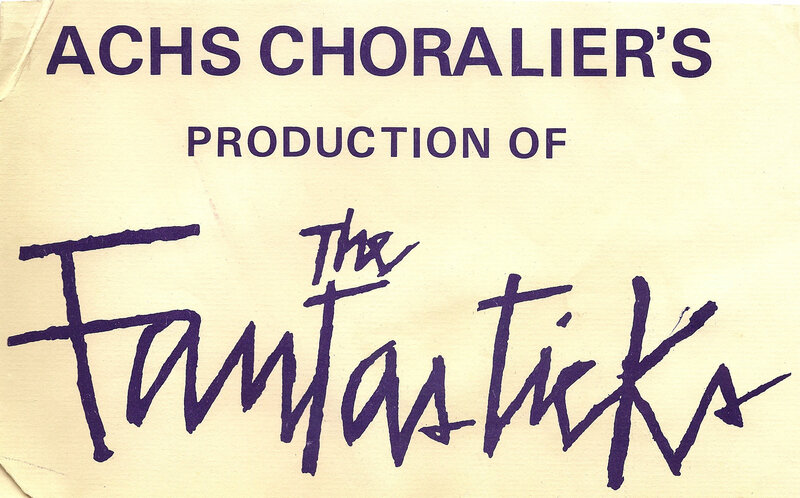 The Fantasticks was a workshop production by the entire Choraliers class. Everyone participated in it and it was another fun and exciting learning experience for us all. 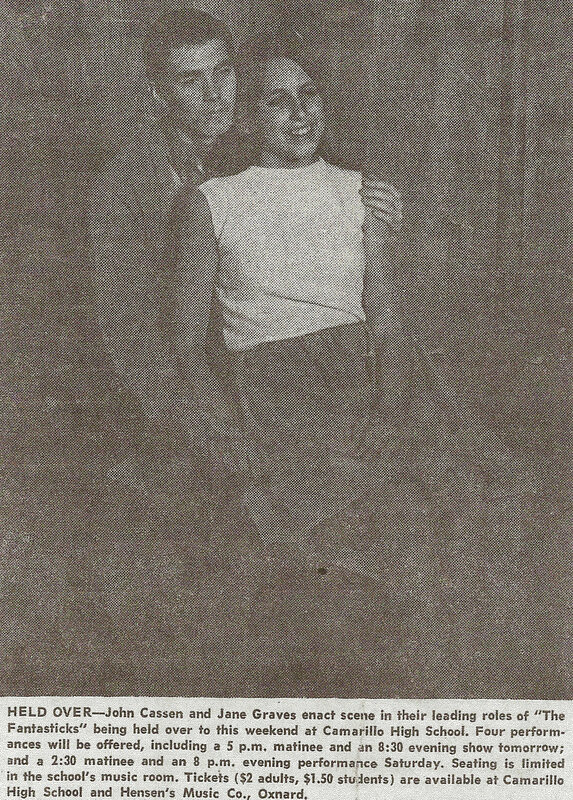 The cast was small, so the parts of the boy, Matt, and girl, Luisa, were double cast. 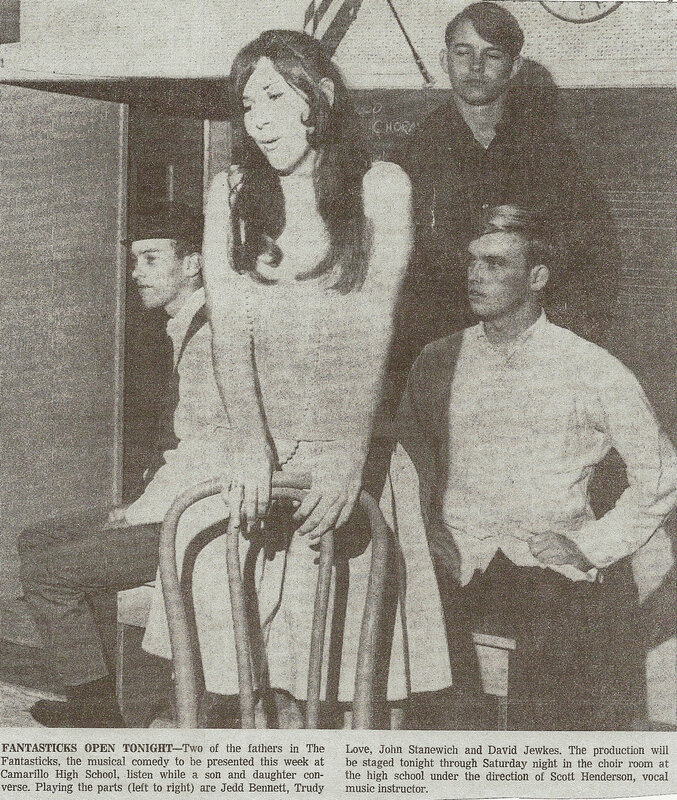 John Lassen and John Stanewich shared the role of the boy, and Jane Graves and I shared the role of the girl. Once again, the work involved provided opportunities for learning and growth, as well as fun and…more fun. 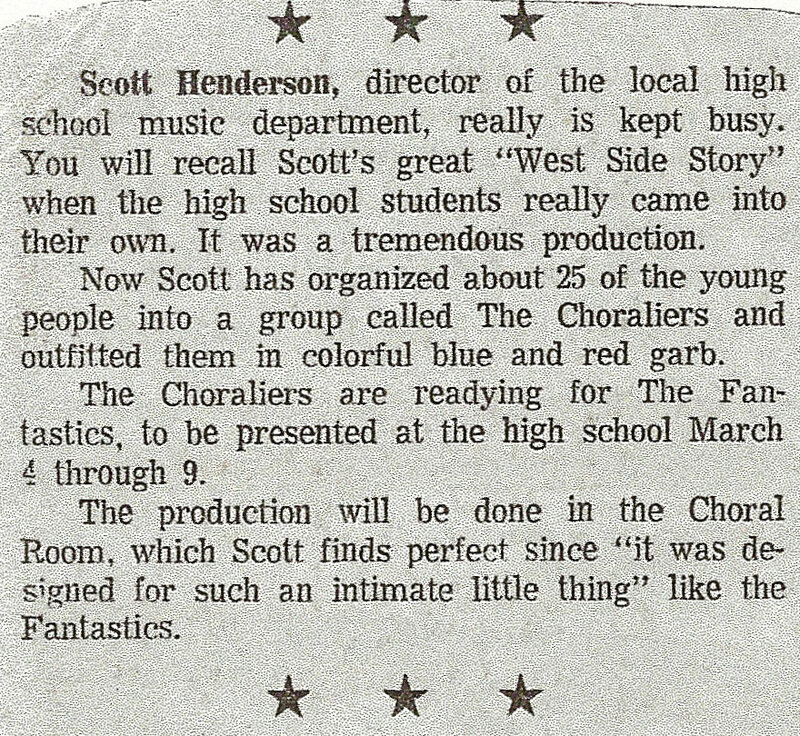 One of my vivid memories is of Mr. Henderson getting so irritated with me because I wasn’t giving it my “all” when I rehearsed my songs. 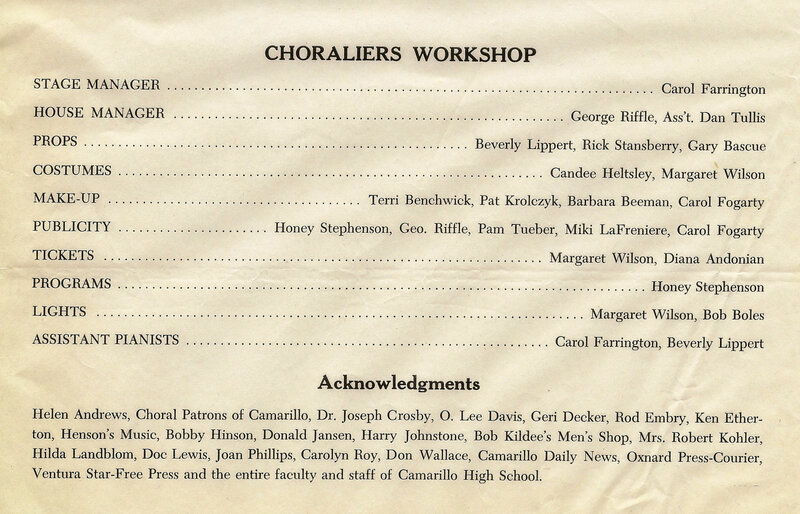 I was convinced that some of the songs were beyond my vocal range, and I held back when I reached the higher notes. He kept telling me to just go for it; make a mistake; let my voice crack, if necessary. But I couldn’t bring myself to do that. Out of frustration he actually threw his baton at me at one point. (I either ducked in time, or he purposely threw it so that it would miss me. I like to think it was the latter.) I was convinced. I think I gave it my all the next time around….and each time after that. 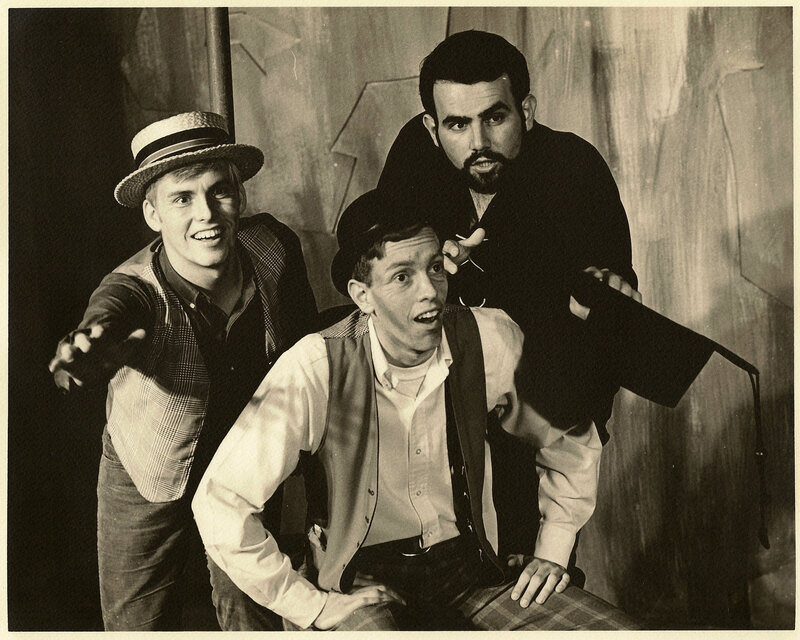 Dennis Wilkerson set up shop with us once again for The Fantasticks and was a major contributor to the success of the show. 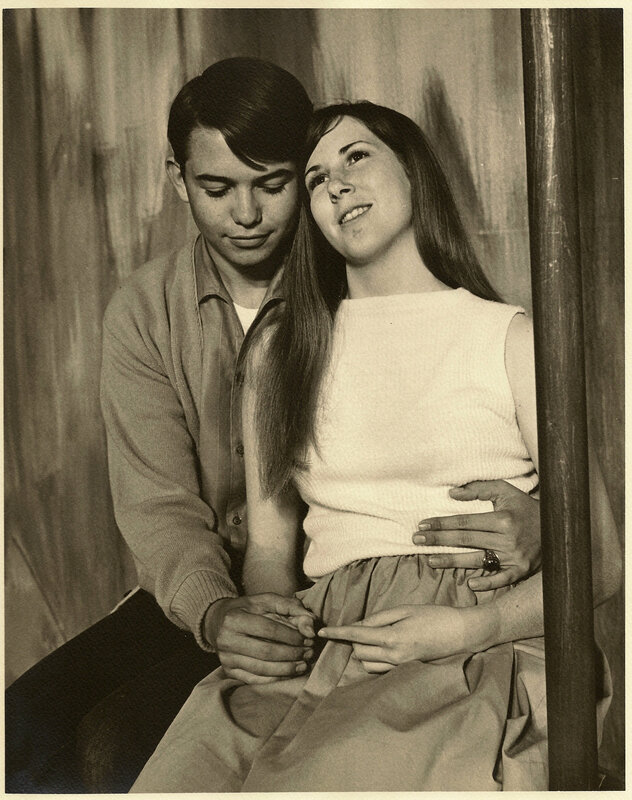 He directed staging; set up lighting; helped design the program; built sets and props. One prop was also part of the set. There was only one problem…. The first time we rehearsed with the Henry and Mortimer tucked cozily in the trunk it came time for them to make their appearance. 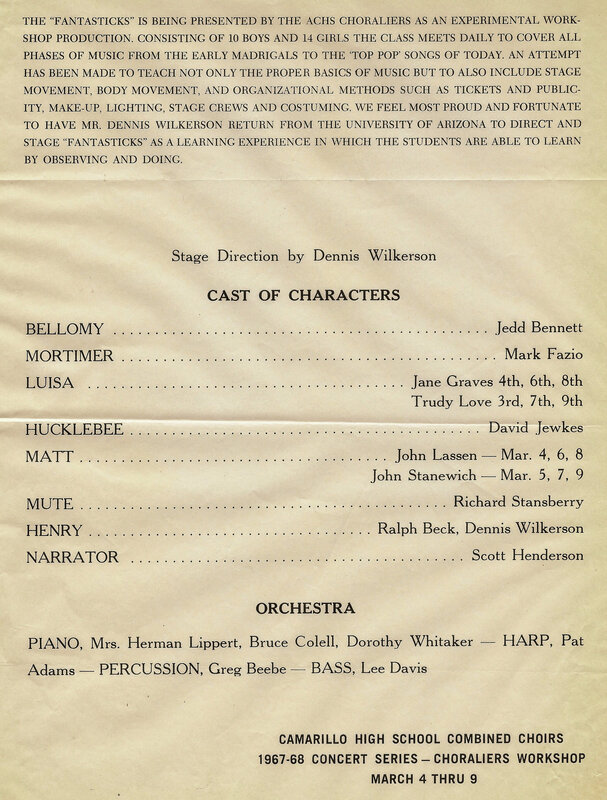 Mr. Henderson, who played El Gallo/the Narrator in our production, spoke his line that was the cue for Mortimer to begin pounding on his drum, the trunk lid to fly open, and both of them to appear: “Something will turn up. I can feel it in the air….” However, nothing happened. So he spoke the line again, a little louder this time. “Something will turn up. I can feel it in the air.” Still nothing…. Once more, with more volume and feeling, El Gallo spoke his line, “SOMETHING WILL TURN UP. I CAN FEEL IT IN THE AIR.” Nothing. Nada. No response. Finally, both Mr. Henderson and Dennis walked over to the trunk and opened the lid…only to find both Henry and Mortimer passed out cold from lack of oxygen! Needless to say, large holes were subsequently drilled into the back of the trunk. 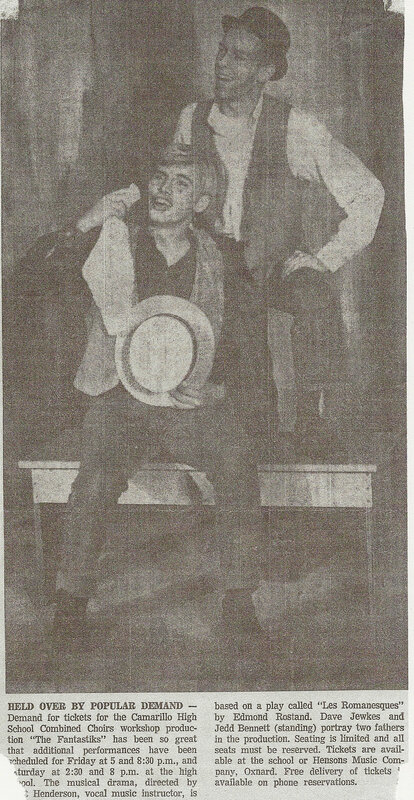 The fathers, played by Jedd Bennett and David Jewkes were a huge hit. Their songs, Make Sure You Never Say No, and Plant a Radish, are full of wisdom and wit, and they made the most of them, to the audience’s delight. Jedd and Dave liked to surprise us during rehearsals by adding, shall we say, ‘extraneous’ and unscripted motions to their songs during rehearsals, just to make us laugh…and boy, we did! Jedd and Dave also teased me about having big feet. And somehow (I don’t remember how) I became known as a troll. Jedd wrote this sweet poem and handed it to me in an envelope one morning: Trolls are neat; Trudy is sweet; Too bad for her that she has such big feet. Needless to say, I was deeply touched. 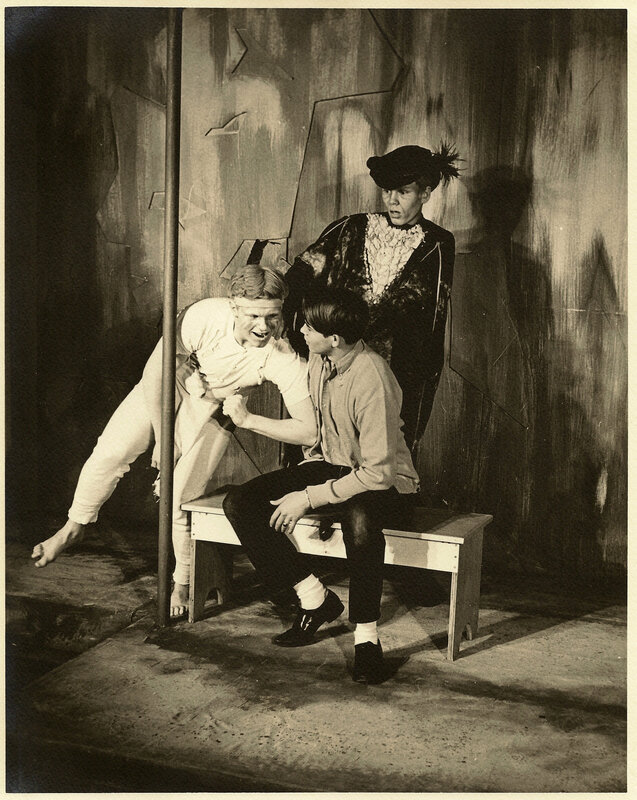 Another of my favorite memories related to The Fantasticks happened during a performance in which Jane Graves and John Lassen were playing the boy and girl. Mr. Henderson was perfect in the role of The Narrator/El Gallo. Handsome, debonair and with a wonderful voice, he could have been type cast. His rendition of Try to Remember is still a favorite. 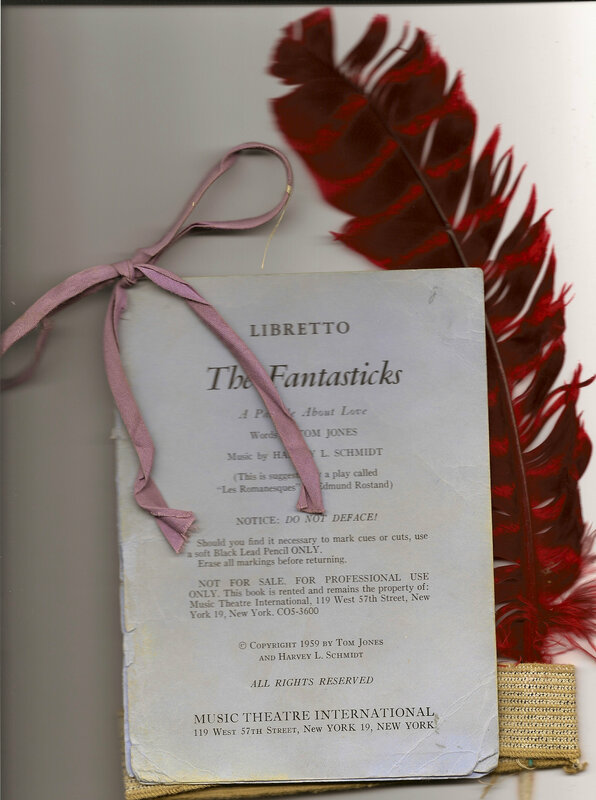 The Fantasticks was sold out and we were able to add additional performances. 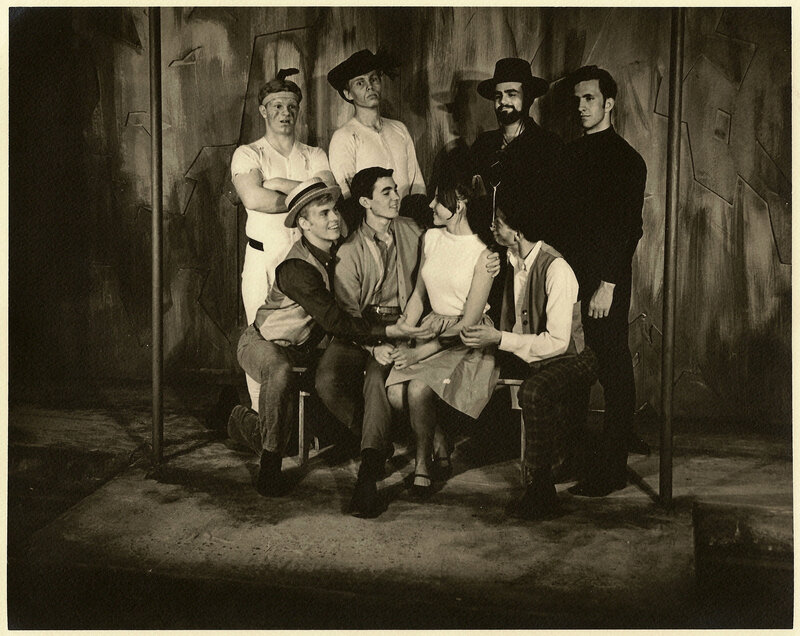 As always, it was because of the hard work of all the people who were not onstage that The Fantasticks was as successful as it was. I felt so privileged to be part of another quality production.